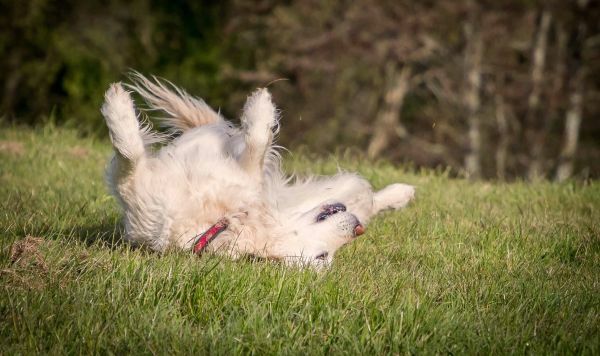 The summer months can be particularly troubling for our pets, but one risk that owners may not be fully aware of is grass seeds. They get into all sorts of places, such as between the toes, down the ears and under the eyelids where they cause irritation and infection. However, occasionally these pesky seeds can work their way inside the bodies of ours pets where they may require extensive investigation to diagnose, and major surgery to address the damage they have caused. This usually requires collaboration between multiple services in the hospital, including those from our diagnostic imaging team. The following case demonstrates how we worked together to solve such a problem for one of our patients at U-Vet. Joni is a three-year-old female spayed kelpie who lives on a farming property west of Melbourne who presented to the emergency centre with a two to three day history of being lethargic and more 'clingy' with her owner. She was reported to be eating and drinking normally and had been heard to cough once the day before presentation. Except for an elevated temperature and some very mild abdominal discomfort her clinical examination was normal. A blood test suggested a focus of inflammation or infection somewhere in her body. Joni was transferred to the internal medicine service for further investigation and a full body CT scan was performed. The radiologists identified an abnormal structure in one of her bronchi in the left lung and a large fluid filled sausage shaped structure (approximately 18 cm long) below her vertebral column in the sub lumbar muscles. 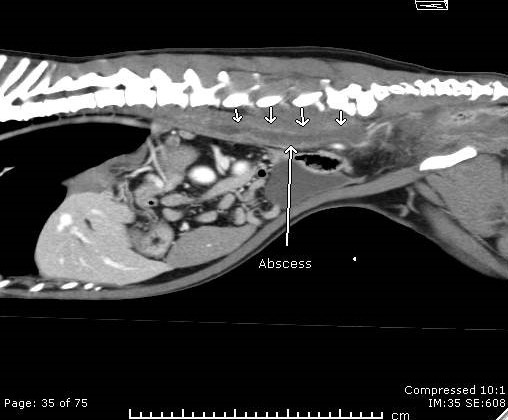 The working diagnosis was that a grass seed had lodged in her bronchus and an abscess had formed in the tissue below her vertebral column. It was likely that Joni had inhaled at least two grass seeds. 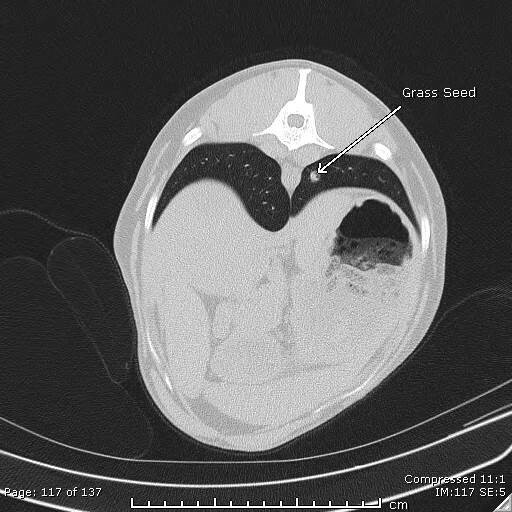 One grass seed was lodged in her bronchus and the second had penetrated through one of her bronchi, travelled through the lung and diaphragm into the tissues below her vertebral column (where the tip of the diaphragm attaches) and an abscess had developed. After discussion with the surgery service it was determined that the most effective way to treat Joni’s problems was to explore both her thorax and abdomen. The grass seed in her lung was lodged deep in the bronchus and a portion of the left caudal lung lobe needed to be removed. Once this portion of the lung was removed the diseased bronchus was opened and the grass seed was identified. Abdominal surgery was then performed to explore and drain the abscess. A large amount of pus was drained from the abscess however no grass seed was found. This is not uncommon as the grass seed often disintegrates in the pus making it very difficult to identify. After spending three days in intensive care Joni was discharged and was doing well when her stitches were removed 10 days later. Read more about our unique diagnostic imaging services and facilities on offer at U-Vet.